As I understand it there was a problem with the acquisition of the steel used to make the transformers. I could probably guess what was happening but I won't speculate about it as I cant say for sure so that wouldn't be fair, what I can say for sure Is that a little honest communication would have gone a long, long way to ease my worried mind. I'm a pretty understanding guy and I know the steel doesn't come cheap. Although it came good in the end at the time I have to admit I was becoming a nervous wreck since I had paid up front in full for 3, 100w and 1, 50w full sets P.T, O.T and Choke. To be fair some of the communication I had was good and I came away with some comfort but on other occasions I felt like I was a huge inconvenience and I need to tip toe around on egg shells if I ever want to see these transformers. It wasn't like I was complaining or bothering him every week I'd just ask for an update every two or three months just to say hey how are we doing? Any closer? The strange thing is I've read other reviews where people had nothing but good things to say about the customer service and advice. More than anything it was the fact that I wanted to use this iron because I've used it before and It sounded great but at more than one point I had nothing to reassure me I would ever see it at all. Funny thing is the West Coast modded 1987 I built has a Classic Tone P.T, a Marstran O.T and a ****** Choke and the amp sounds every bit as good as any other I have except for the fact the Classic Tone and Marstran were packed really, really well and both arrived in very reasonable time with great communication and service when needed along the way. As a result I wouldn't put myself through this experience again. I always give credit when I have a good experience but unfortunately this is the very first time I have something negative to say about a purchase experience. Anyway enough of that. I had been notified to expect the shipment so I was quite excited about it. Finally the day came and part of the order showed. The box looked like it had been mauled by a Bob Cat and looked as though it had been opened by customs. When I opened it the scene was carnage, the units had been rolling around in the box like a bunch of coconuts smashing each other up. Customs didn't even wrap anything back up but to be honest there wasn't a whole lot to wrap it all back up in since the only thing in the box was a few random lumps of foam that looked like they were torn from a couch cushion and a scrap of bubble wrap. Some of the laminates were smashed in on the corners and some had come away and were bent on the P.T. Some of the insulation on the leads was stripped to the copper and some just crushed along with dented bell covers Scratches and mangled brackets. To be honest I had to let it go for a couple of weeks till I could look at it and think about it with a clear head. So eventually I came round and thought really there's no point ordering another set from this guy, it took long enough to get my hands on this set. I thought realistically I've got nothing to loose, I can try salvage it and if it blow's up I'd order a new set from Mr Wallace. I removed the bell cover, inspected it all and tapped out the dents, I'd have to live with the scratches. I straightened out the feet on the O.T and laminates on the P.T and when I mounted it the laminates pulled flush and things were starting to look like it would be alright. 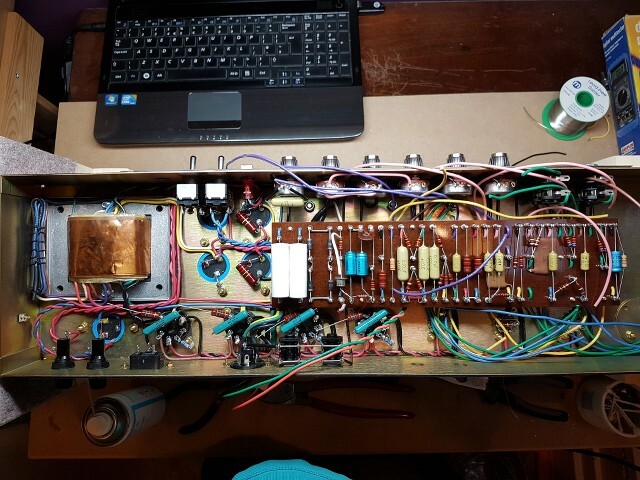 I jointed all the damaged leads and insulated with heat shrink, I then tested for any continuity between winding's and to the chassis/Bell Covers and Laminates and thank the Lord it all seemed good enough to take a chance and fire it up. On a positive side note I should say on the next two sets of transformers I received they were fitted with special bell covers that only go on transformers for his amp builds and for that I am very appreciative because they really do look very impressive. 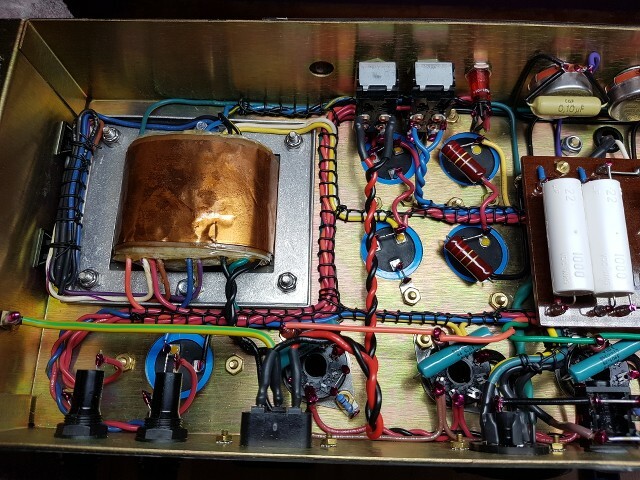 The time came to fire it up but the bias circuit wasn't working correctly so I pulled the NOS Tesla electrolytic caps and the trim pot and fitted current production components. I ended up doing this to all my builds so they are now all swapped out. It also blew a snubber cap so I swapped those out on all my amps as well for current production caps. With that sorted I moved on to testing which went well so I moved on to getting it biased up, I'm biased at 65% and I'm getting 520v on the plates so I'm using NOS Mullard XF2's. On to plugging it in with a guitar! Its very quiet so looks like the Larry grounding scheme worked well. 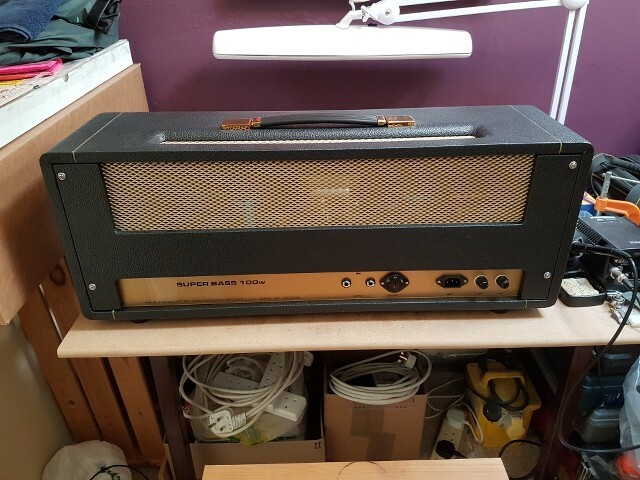 I hooked it up to an over sized 2x12 StoneAge cab loaded with one 55Hz and one 75HZ Scumback speakers. I think the only word for it is Righteous with a capital R. it sounds amazing, better than I could have imagined. I've never played an amp like this before and it seriously has me re-evaluating everything I've ever known. Then I noticed there was a loud POP when I flicked the pickup selector and crackling when I rolled the guitar volume's up or down, oh no! So I looked into it and I'm starting to think leaky coupling cap. I tested them as good as I could with a multi meter and nothing seemed out of place. I then went through it with an esr meter, again nothing out of place. I then went through and de soldered each cap on the negative side in turn and measured for leaking voltages to ground with my multi meter. There was a little leakage on most of them but a couple that looked a little more suspect. There was a bit of crackle on the Mid pot and the 270pf silver mica in the tone stack was leaking quite a bit also the coupling cap to the phase inverter which could both be good culprits so I went and replaced these two caps. 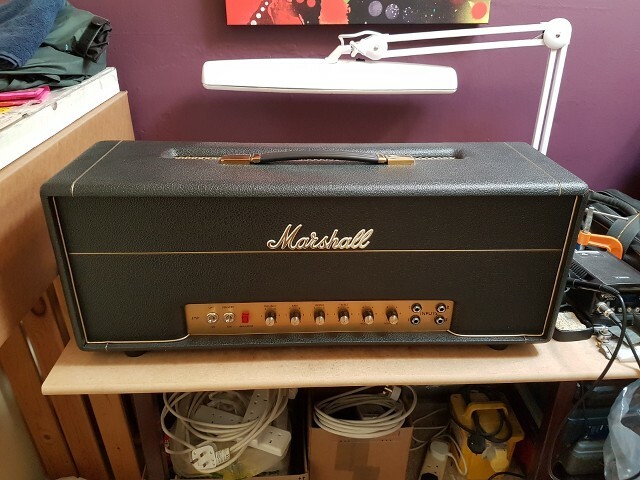 I fired it up and all the pots were now good, dead quiet except for as expected the presence pot but the voltage was still on the inputs and getting in to the guitar. Whats most annoying was it was only 0.6vdc but I guess that's all it takes. It was the pre-amp plates leaking voltage from the junction of the two 100k resistors to the inputs. I verified this by de-soldering this junction from the turret and problem solved. 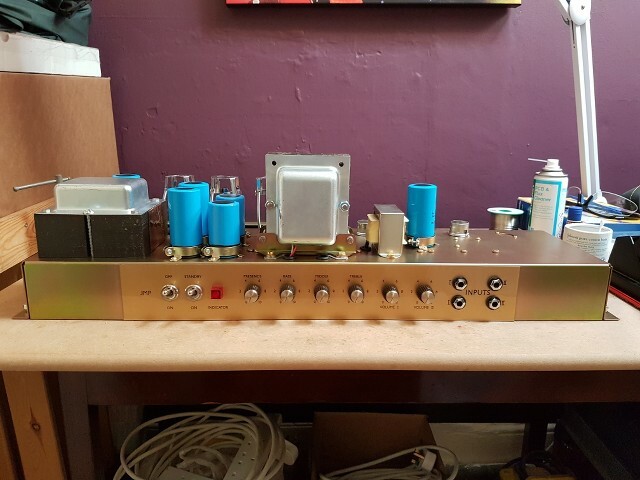 On this amp I used whale grade Tuffnol which doesn't have the same electrical insulation properties as carp brand which essentially has a finer weave of fabric in the resin. Although the tech sheet looked fine for purpose I guess with the coarse weave it must absorb moisture and wick it between the turrets easier. This is a massive bummer because the Whale grade seems to look better than the Carp and I had used Whale grade on another 1987 build and even worse I'd made it a perf board. As it happens when I got to it the 1987 had problems and so did a 69 I built with a perf Paxolin board but I never had any problems with the Carp boards I used on the 2203 and the West Coast 1987. 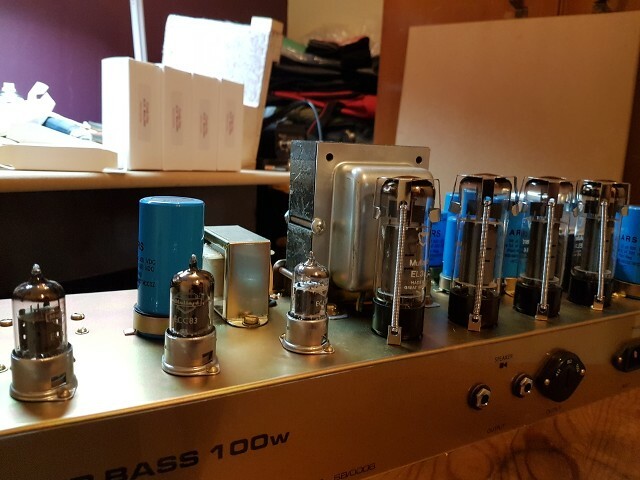 After sorting this amp I put alot of thought into it and came up with a solution to the two other amps that worked but I'll get to that later in the write up's for those amps. 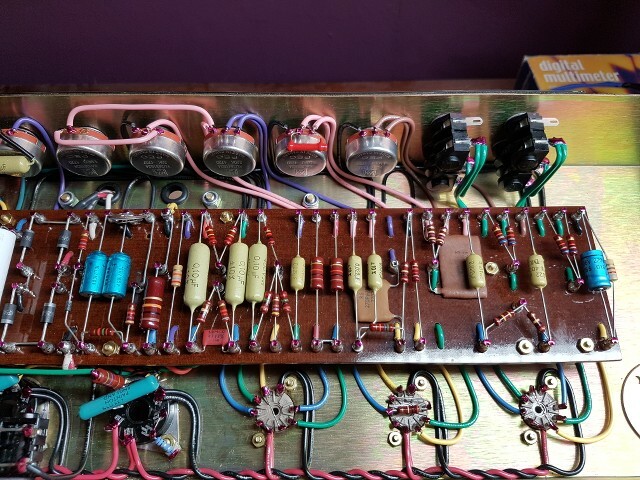 Anyway I stripped the board out and removed all the components. I have a Megger from when I used to be on the tools as an Electrician so this meant I could put a test voltage of 250v, 500v or 1000v between turrets to see where the insulation was failing and sure enough it was the plates to the inputs. 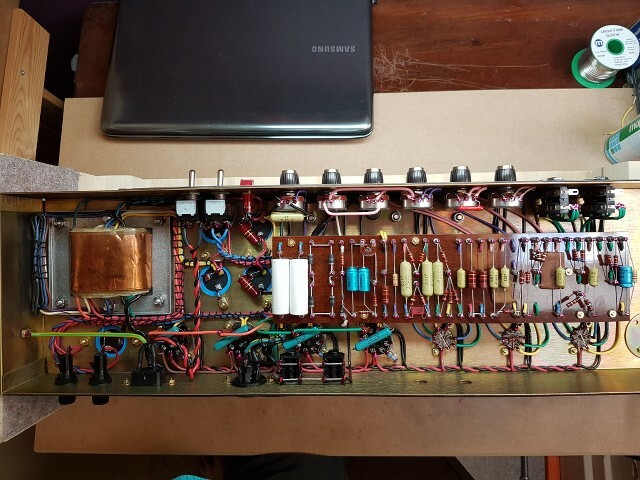 There's obviously a bit of voltage on the plates and it makes it worse that its a high voltage amp with only one 10k pre-amp dropping resistor. There were also other turrets that were not dead shorts but the readings were lower than what I'd like to see. 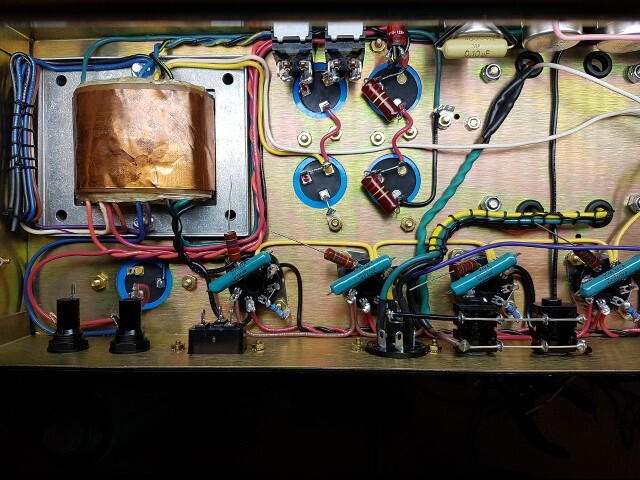 Not low enough to fail an electrical installation but low enough to pass some voltage between turrets which is enough to cause trouble in a tube amp. I made another board and Meggered it out and again I was getting similar low readings between certain turrets, different ones than the last board but its definitely the board material. I tried Meggering all the turrets out at 1000v in an attempt to dry it out and it did work to a reasonable degree but I thought If it got soggy once it would do it again so I ordered a fiberglass board and in short no pun intended re built it and that was it, problem solved. So there it is all done, finally... It was quite a challenge with no shortage of headaches but I learned allot which is always good and It really does sound the mutts nuts if a little different now but that could be down to allot of differing factors. I can really hear Free, Humble Pie, Peter Green era Fleetwood Mac especially the riff to Oh Well. Cant wait to check it out with a bit of Fuzz or a Range Master. Bottom Line it rocks. I have noise restriction problems here so I'll be looking to get all my gear to a rehearsal space very soon to really get some hours on it. It will be interesting to compare because I cant help thinking a slight leakage on the board will have an impact on the sound, I know this is probably murky water but first impressions were that there is a slight difference maybe it sounded a little softer around the edges before. I need to play it more and compare to make a better assessment. I chainged the bias trim pot and electrolytic caps for current production components as well as the snubbers. I also chainged the top hat diode in the bias section for a regular N4007 diode because the metal casing of the top hat diode was dangerously close to the diode in the bridge rectifier. High voltage tap on the P.T yielding 520vdc on the plates at idle biased @ 65%. If I remember next time I have it open I'll get a shot and post it. Its exactly the same though really just with a perf red swirl fiberglass board. Another thing while I remember it, when I went to do the rebuild I went to order some new Amphenol tube sockets from Valvestorm but they were out of stock at the time so I had a look around and found some on the bay. They were NOS Amphenol sockets that had C6A7 etched into the top, I beleive they are ex US military. I found though if the tags were bent straight the tag and contact pins could be pulled out of the socket so they needed to be bent over to stay in place when inserting the tube. This wasn't a problem because I would usually bend them over anyway but what I did notice when I was biasing I couldn't push the probe too hard on the socket terminals or the reading would start dropping off. From this I am guessing by pushing too much on the terminal it was making the socket loose contact with the tube pin so I'll have to keep an eye on it. Just thought people should know. I was thinking about the amp sound again and another thing that it instantly reminded me of was The Allman Bros not only that what hit me was the sheer size of the sound, it has clarity punch and grind and it's really big fat and juicy. especially the feel, I was thinking it would maybe be hard to play and maybe overly bassy and woolly but that is definitely not the case. OP. where'd you get those fat square RS caps!?? M. A Components, it's a ebay store on Ebay UK.